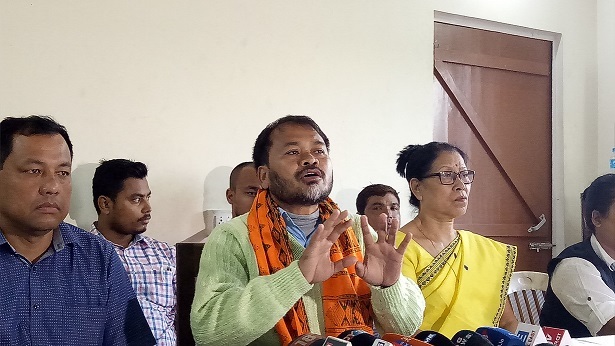 The Krishak Mukti Sangram Samiti has lashed out at the government for not granting permission to it to hold agitation on November 16 in front of Janata Bhawan but at the same time allowing NESO to hold protest demonstration in Guwahati on November 20. Challenging the government, Gogoi said the organisations would stage the mass agitation in front of Janata Bhawan on November 16 in a democratic and peaceful manner following the Gandhian policy of ‘Ahimsa’. “We are not concerned about whether the district administration grants us permission or not. We will raise our democratic voice for the interest of the people,” Gogoi said. “This is discrimination and a planned attempt to break down the democratic voice of KMSS and other supporting organizations,” Gogoi said. Gogoi said the Citizenship (Amendment) Bill, 2016 would change the definition of ‘illegal migrants’ in the Citizenship Act 1955. “This has conspicuously indicated that BJP has made all the provisions to grant citizenship to illegal migrants at a cost fee of Rs 100 only. I would say it a wholesale business of granting citizenship at a very low cost and BJP is the owner of the business,” Gogoi said. Gogoi affirmed KMSS and other supporting organisations would never let the government to implement the bill and continue its agitation until the bill is scraped. Slamming the ruling saffron party for its failure to maintain peace and harmony in the state and keep the energetic youths in the mainstream, Gogoi questioned whether the government’s ‘anti-community’ behaviour on the Citizenship (Amendment) Bill, 2016 had forced the youths of the state to join ULFA (I). “It is a bad sign for the society. But, it is also a fact that the government has created the plot by striving to implement the Citizenship (Amendment) Bill, 2016. The bill has brought a new nationalism among the people of the state and that is a good sign for the Assamese community,” Gogoi said.